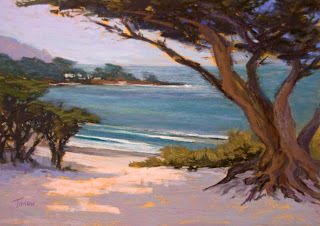 I just returned from the Carmel Art Festival in Carmel, California. 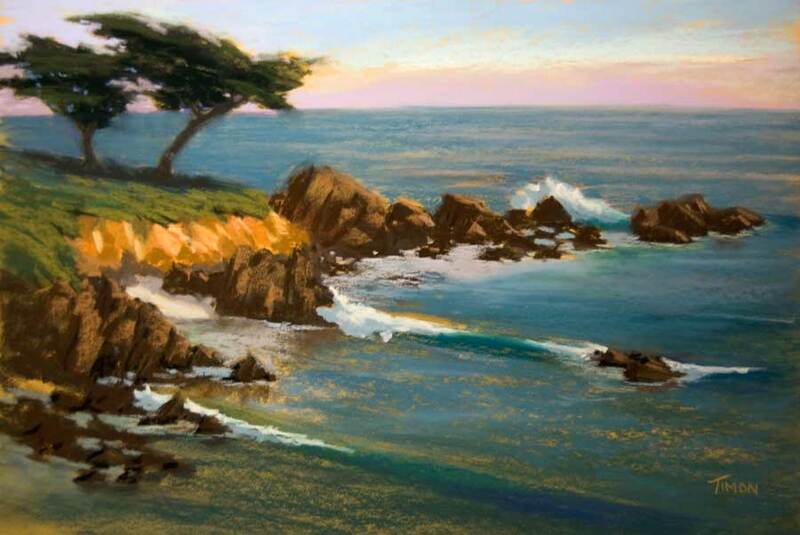 The festival is an invitational plein air painting competition where juried artists converge on the town to paint and then show ‘wet’ paintings through the weekend. As artists we have just 48 hours to paint. We arrive on Wednesday evening to get our canvases stamped on the back, and then we’re off and running. Running can really be the operative word here, because if the weather is bad you can spend a lot of time driving while seeking out better conditions. Wednesday evening and Thursday were both lousy days for painting – overcast and dreary. On Wednesday I drove back into the valley hoping to find good weather. Not. It was dreary, cold and windy. 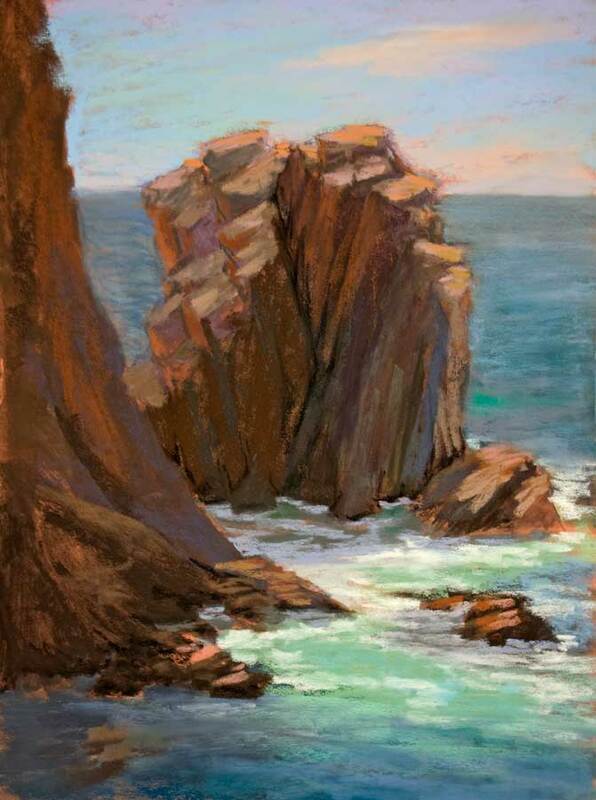 I did a painting – but only because I was feeling the pressure to get started. Thursday morning was no better. I wound up driving 40 miles south along the coast. 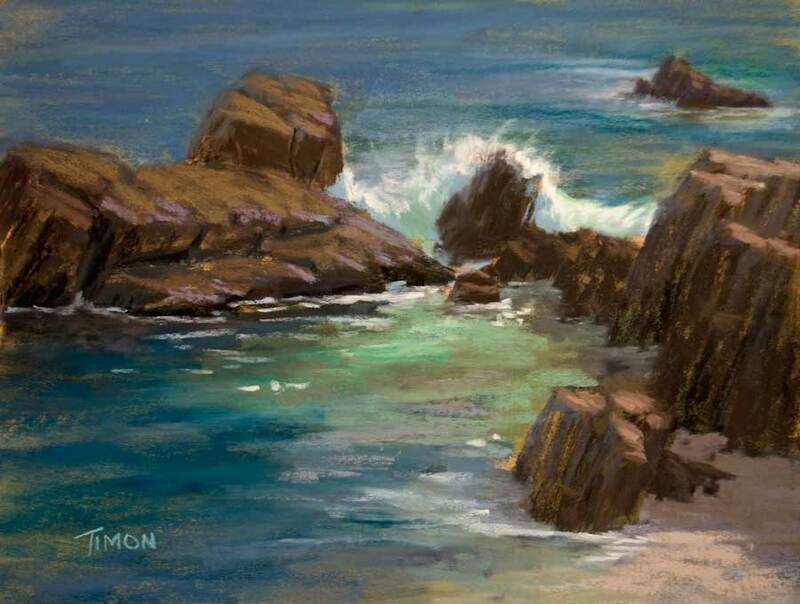 I finally came across good weather, and was able to paint atop a cliff looking down into the Big Sur coastline. When you’re standing in good weather it’s hard to imagine that it’s bad elsewhere. I made this mistake and figured the weather must have improved back in Carmel, so I headed back and wound up mired in the fog again. I was checking the weather forecast Thursday night and it looked pretty bleak for Friday. Lots of fog was projected. To my great surprise, when I got up and stepped outside the light was just terrific. I skipped breakfast and didn’t even stop for a cup of coffee. Instead, I headed straight for the coast and got two paintings finished before 11am – both painted from the same spot. As it turns out, these were the two paintings that I entered and sold over the weekend. These events are kind of like the ‘x-games’ version of painting. 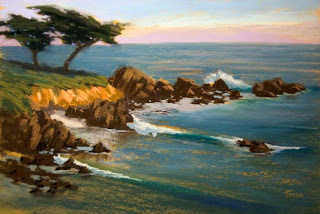 It’s kind of crazy to be painting under such time pressure and with the huge variable of unpredictable coastal weather. I do, however, love the energy and enjoy meeting up with friends over dinner and drinks at night. At the beginning of the week I was wondering if it was all worth it, but by the end of the week I came away invigorated and glad that I had made the effort. 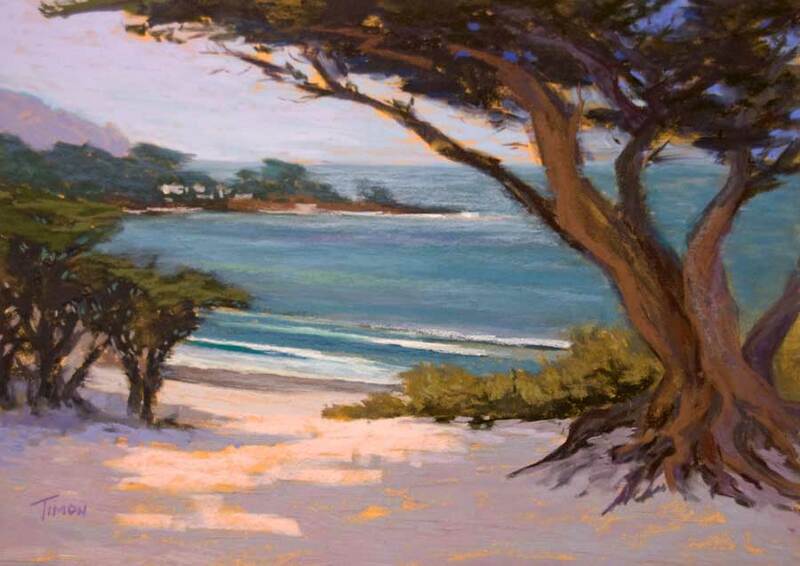 Congratulations on your success and sales at the Carmel Plein Air event! I enjoyed hearing your story inspite of the poor weather conditions you had to work with.